Take, for example, “biblical preaching.” “Biblical” here does not mean we only use the Bible in sermons. Biblical preaching expounds the Bible, but it also draws from non-biblical sources—some of them authored by unbelievers—such as syntactical, grammatical, lexical, and textual guides and commentaries. We often incorporate historical, geographical, sociological, and cultural research. We regularly draw from current scientific findings and the modern media to teach, explain, or illustrate a point. Even the form and communication style of most modern sermons has been derived largely from ancient and modern philosophical and political speech forms. However, although some of the content and form of biblical preaching is drawn from outside the Bible, we believe that God has provided a Bible that is up to the task of filtering out the false and admitting the truth of God that he has graciously placed in the world. For some in our family, “biblical” means “Bible only.” For them, biblical counseling could be more accurately renamed “Bible counseling.” In principle, it means they use only the Bible in counseling people; nothing else is helpful, and anything else is compromise. In the spirit of friendly dialogue, I’d like to follow-up on David’s analogy. I don’t believe his analogy captures the concerns of biblical counselors. Before I make that analogy, consider a comparison: both biblical counseling and biblical preaching are ministries of the Word. Biblical Preaching: The pulpit ministry of the Word, the public ministry of the Word. Biblical Counseling: The private ministry of the Word, the personal ministry of the Word. When the pastor preaches from the pulpit, he focuses on relating God’s truth to life. When the pastor shares in interactive, conversational ways in the pastoral counseling office, he focuses on relating God’s truth to life. 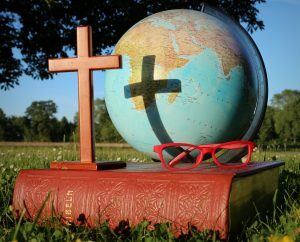 Is It “Biblical Preaching” If the Content, Foundation, and Worldview Are 95% Secular? Here’s the first analogy that biblical counselors would use. Some counselors say they are doing Christian counseling when they open and close in prayer and perhaps sprinkle in one verse during the 60-minute meeting. To use the preaching analogy, is it biblical preaching if the content, foundation, and communication of the message is composed of 95% secular worldview with an opening and closing prayer and one verse mentioned but never developed? If 95% of the message contains the viewpoints of 20th Century atheistic philosopher Bertrand Russell, and Gandhi, and liberal theologians, is it biblical preaching? This is the concern of biblical counselors: is the authority basis for the Christian life built upon biblical theology? Or, is the authority basis for the Christian life built upon the theories of secular philosophy, secular psychology, and secular sociology? The key word here is theories—worldview, the source of understanding of people, problems, and solutions. Now, some may say, “You’re using an outlier, Bob. No Christian counselor would be 95% secular.” I recently read a major Christian Integrative Counseling text. The index of sources was multiple pages—with the majority of those sources being secular. The Scripture index consisted of 3 verses—covering over 750 pages of text. I love my Christian Integrative Counseling friends, but I would humbly encourage them to consider if sometimes there is a lack of theological richness and biblical robustness. Is It “Biblical Preaching” If the World’s Authority and Wisdom Are Placed Over the Word’s Authority and Wisdom? But let’s assume the first analogy is an outlier. Here’s a second question: “Is it biblical preaching if the secular worldview holds sway over the Bible’s worldview?” Both are quoted in a sermon (the world’s wisdom and the Word’s wisdom), but when there’s a discrepancy, the world’s wisdom trumps the Word’s wisdom. How many of us would attend a church where an entire 12-week series placed the world’s authority over the Word’s authority? And yet, some models of integrative counseling do that. This is where biblical counselors are concerned. The analogy is not about syntax, but about worldview and the source of authoritative wisdom for life. Is It “Biblical Preaching” If the World’s Authority and Wisdom Are Seen as Equal to the Word’s Authority and Wisdom? Again, David or others may say, “But the committed, well-trained Christian Integrative Counselor is not going to place the world over the Word.” So, let’s ask another question. “Is it biblical preaching if the world’s authority and wisdom are seen as equal to the Word’s authority and wisdom?” Both are quoted an equal amount. Both are seen to have areas or spheres of authority. Bertrand Russell’s secular worldview is given equal credence in matters of faith and practice as Peter, Paul, James, John, or Jesus. How many of us would listen to sermons for 12 weeks when worldly wisdom for living is given equal footing with the wisdom of the Word? How many of us should attend 12 counseling sessions where the counselor gives worldly wisdom for living equal footing with the Word’s wisdom for living? Is It “Biblical Preaching” If the Word’s Authority and Wisdom Are Seen As Superior to the World’s Authority and Wisdom, Yet the World’s Wisdom for Living Is Still a Major Foundation and Component of the Preaching? So, yes, a preacher might quote from a movie—but illustratively to help describe a biblical principle. But if that preacher, even if he talks about the authority of the Word over the world, builds the thesis of his sermon from the movie, or builds major points of his sermon from a liberal theologian’s understanding of life, or builds components of his sermon from a secular philosopher’s worldview—for 12 weeks in a row—how many of us would keep attending that church? This moves us to the heart of the issue. Do we have confidence that God’s Word has robust, rich, relevant, relational, profound wisdom and insight for the soul issues we face every day? Or, do we believe that the fallen world, in rebellion against God, has robust, rich, relevant, relational, profound wisdom and insight for the soul issues we face every day? Biblical counselors are concerned about a biblical worldview—about building our understanding of people, problems, and solutions from a rich, robust, Christo-centric, gospel-centered, God-glorifying foundation. We are “Bible only counselors” when it comes to biblical worldviews about people, problems, and solutions—living whole, healthy, and holy lives in a fallen and broken world. Biblical counselors are not “Bible only counselors” when it comes to understanding medical science, neurological research, or descriptive psychological research. (For a robust presentation of the biblical counseling view, see the Biblical Counseling Coalition book Scripture and Counseling, and for a summary statement see the Biblical Counseling Coalition’s Confessional Statement). A couple of examples might help—first, neuroscience. Dr. Charles Hodges, an MD and a biblical counselor, wrote the book, Good Mood Bad Mood where he quotes many neuroscience articles. They were all placed under a biblical grid. Neuroscience, when it “stays in its lane” of doing neurological research, is not a “worldview.” There’s a worldview behind it (often an evolutionary one) that must always be considered. But neither Dr. Hodges nor I would have a problem with a legitimate neurological finding being shared with a counselee. That may be more like the syntax analogy that David Murray uses. What about psychological research? Again, even worldview perspectives creep into how one does research. Yet, biblical counselors have expressed openness to descriptive psychology—a description of what happens, not a diagnosis of why and not a prescription of what to do. When descriptive psychology “stays in its lane,” I could potentially use a finding under the authority of Scripture. For example, in God’s Healing for Life’s Losses, I briefly introduce one descriptive model of the grief process: denial, anger, bargaining, depression, and acceptance. It’s one way of describing how people stereotypically respond to loss in a fallen world. It is not prescriptive. In the rest of God’s Healing for Life’s Losses, I explore what the Bible’s wisdom communicates to us about a Christ-centered way of moving through grief—prescriptive, theoretical, theological biblical counseling. The description comes from research. The diagnosis and prescription comes from the Word. Biblical counselors do not want to integrate biblical counseling theory with secular counseling theory—ideas about people, problems, and solutions—because those are fundamentally theological issues—yes, biblical issues. In theory-building (theology-building), yes, biblical counselors are “Bible only” without apology. Just like preachers who build their messages on the exegesis of the text of Scripture and on a comprehensive biblical worldview are “Bible only” preachers—without apology. So, what do you think—what makes biblical preaching and biblical counseling biblical? Note: As my post was going “live,” I noticed that David also has a more recent post on this topic: Do We Need More Than the Bible for Biblical Counseling? I think his argument in this more recent post is similar to the analogy David used in his 2012 TGC post. https://www.facebook.com/plugins/like.php?href=http%3A%2F%2Fwww.rpmministries.org%2F2017%2F10%2Fbiblical-preaching-biblical-counseling-what-makes-biblical%2F&layout=standard&show_faces=true&width=450&action=like&font=arial&colorscheme=lightThe post Biblical Preaching and Biblical Counseling: What Makes Them “Biblical”?appeared first on RPM Ministries.